Opening ceremonies are, I think, the bane of the forgetful sports fan's life. You get so hyped up and excited by all the coverage, all the previews, all the press that you tune in to watch right from the beginning. And what you invariably see is folk dancing and people in suits remaindered from the set of It's A Knockout. If you're really lucky, you may even experience David Coleman or Barry Davies commentating on affairs. That's the final kick in the teeth, really. I've been stung by opening ceremonies too many times to be tricked into watching this afternoon's extravaganza from Beijing. Besides, I can already imagine what it will be like. Fan dancing and dragons will be very much in evidence, all served up with a chaser of faintly unsettling fanaticism. I will, however, break this self-imposed exile if at any point I hear rumours about athletes requiring nebulisers thanks to a big smog cloud. But smog can wait for another day. Because I'm happy to reveal that I have been bin diving outside Boris Johnson's barbers, and am able to exclusively reveal the itinerary for the London 2012 opening ceremony. Remember where you read this first, folks. 6:59 p.m. The Dance of the Construction Workers. Men in suits with 14 laminate security badges chase the last of the builders out of the stadium, where they were hurriedly trying to secure the last bit of roof. The builders are later seen handing out spanners and plastic seats to the spectators. 7:02 p.m. Cockney knees-up. A one hour celebration of local culture and colour, led by Chas and Dave. A troupe of dancers, all dressed as Pearly Kings and Queens with pugs under their arm, do the Lambeth Walk round the running track. 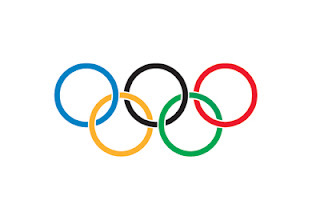 From 7:30 p.m. the theme will undergo a subtle shift, and start to celebrate diversity and the Olympic ideal - but still within the framework of a knees-up. To this end, traditional dances from all over the globe will be on show, but their practitioners will all be dressed as Pearly Kings and Queens. 8:00 p.m. The Olympic Torch enters the stadium, carried by Linford Christie who will be pretending to have Parkinson's. To light the stadium beacon, Sally Gunnell will fling it. 8:10 p.m. The speeches. The Head of the IOC declares the games officially open. The Queen is later seen hoofing him in the pods for being so presumptuous. 8:25 p.m. A live celebrity The Weakest Link takes place in the infield, with the cast of EastEnders and Noel Edmonds if he's not busy.